Ballpark Figures: Hot Commodities — Bloomberg Television’s Michele Steele and Bloomberg Sports Fantasy Analyst Rob Shaw are talking some baseball. Today, they take a look at some of the hidden jewels off the waiver wire. Shaw points us to Cody Ross, an outfielder for the Marlins who has big power potential. On that note, Michele responds with Mike Napoli, the Angels catcher who can blast 30 home runs. Finally, Shaw refers to Rockies hurler Jeff Francis as a pitcher who can win a dozen games with solid strikeout totals. Here are the facts: John Maine threw five pitches to Nyjer Morgan in his last start for the Mets and was pulled. Maine was then placed on the disabled list with chronic shoulder fatigue. Which leads to the question: is it possible that Maine’s shoulder fatigue showed up in the pitching data? With the Bloomberg Sports’ Pro tool we decided to try and find out, focusing specifically on his release point. The following graphic shows John Maine’s release points for the Morgan at-bat, along with the corresponding strike zone. Quadrant A is of particular note – that’s the spot from which two of his pitches originated. The left side of the graphic shows the release points, while the right side is the strike zone. Highlighting a particular zone results in those specific pitches being highlighted in the strike zone. Both pitches were balls, and neither reached 84 miles per hour. Or to put it another way, Maine released 40% of his pitches from Quadrant A, and 100% were balls. The three other pitches Maine threw were right on the edge of Quadrant A. Five pitches is an insignificant sample size, so let’s look at all the pitches Maine has thrown this season and how many originated from Quadrant A.
Maine has thrown 768 total pitches, of which 31 came from Quadrant A. You can also see that Maine throws the majority of his pitches from the quadrant directly below A. The following table provides a pitch results breakdown, including how many of the pitches were greater than or equal to 85 miles per hour. What we see is that 4% of his pitches came from Quadrant A, more than 50% were balls, and just about half were greater than or equal to 85 miles per hour. 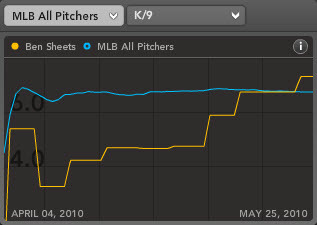 To get a clearer picture, here are John Maine’s pitches from 2008-2010 in an aggregate form. The number in Quadrant A is a little difficult to read – it says 103. The following table shows how many of Maine’s pitches over the years were thrown from Quadrant A, along with the results. What exactly is wrong with Maine is best left up to the medical experts, and the data do not point directly to shoulder fatigue. What is evident is that this season, statistically speaking, he was releasing the ball from a higher point with more frequency, and was pitching differently. What Mariner is Rob Shaw’s dog named after? In the case of C.J. Wilson, it’s time to give Tommy Rancel a little credit for identifying him as a possible sleeper in the pre-season (while also illuminating some of the concerns with moving a pitcher from the bullpen to the rotation). Now that Wilson has started out well, the question immediately shifts to his value going forward, and whether or not he is a sell-high candidate. Despite struggling in his last two starts, his year-to-date numbers look strong, as the Bloomberg Sports Fantasy Tool charts to the right show. At our disposal, we have tools like FIP (fielding independent pitching, which strips out batted ball luck and produces a number on the ERA scale). Wilson’s’ FIP is a decent 3.72. That’s probably the result of his lower strikeout rate (6.75 K/9) and .275 BABIP. While the strikeout rate is barely above average (6.6 K/9), the BABIP is actually less of a concern than usual. Not all BABIPs are created equal. We talk about how it generally trends toward .300 across baseball, but that presupposes an average defense. Not all defenses are created equal. The Texas Rangers have the fifth-best defense in baseball when measured by UZR/150 – Ultimate Zone Rating. UZR attempts to take player positioning and ball trajectory, as well as home park intricacies, into account when rating defense. With Michael Young moved over to third base, defensive whiz Elvis Andrus doing great glove work – and even young Justin Smoak “Monster” bringing a nice glove with him to the major leagues – the ranking passes the sniff test. Finally, the Rangers as a team have allowed a .290 BABIP. So Wilson’s .275 BABIP may rise, but perhaps not as much as the average pitcher. We are still left with a precipitous drop in Wilson’s strikeout rate. After setting a career high last year (10.26 K/9), some regression was inevitable due to his change in roles. Now that he’s dropped below his career rate (8.09 K/9), it’s hard to say what’s to come. We know that velocity and effectiveness usually drop with a move to the rotation, as pitchers can’t go all out every pitch for seven innings as a starter than they can for an inning or two as a reliever. Even accounting for those expected declines, though, Wilson’s velocity has fallen more than the average 0.7 MPH gap between starter and reliever (as Jeremy Greenhouse showed in an article last month). In fact, his fastball velocity has dropped 2.9 MPH with the move. Still, we have a pitcher that has an average walk rate, a barely above-average strikeout rate, and one solid skill on his side. Wilson has continued inducing worm-burning grounders at a good rate (53.3% this year, 53% career), and that can limit the damage, as evidenced by his 0.48 HR/9 rate – it’s hard to get hit out of the park on the ground. While a home run rate that low is usually unsustainable, the nine pitchers that averaged less than 0.6 home runs per nine last year averaged a 49.3% groundball rate. Of course if you can get a return on Wilson from an owner that values him as an ace, do it. But always consider context. 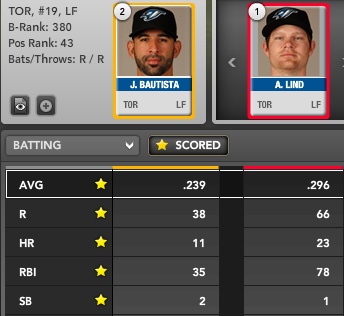 I’m currently in a Blog Wars league where I am about to accept a trade – my Roy Oswalt for his Miguel Montero and C.J. Wilson. I need the offense in this two-catcher deep league, and I don’t think the step down is too steep for my staff to handle. As you can see, the Bloomberg Sports Fantasy Tools trade analyzer likes the trade, an encouraging sign. For more on C.J. Wilson and possible trade targets, check out Bloomberg Sports’ Fantasy Tools. Ballpark Figures: Stock Report — Bloomberg Television’s Michele Steele and Bloomberg Sports Fantasy Analyst Rob Shaw are talking some baseball. Today, they discuss the bulls and bears on the fantasy baseball market. Shaw tells us that Rays super utility man Ben Zobrist is a great buy low option and Reds slugger Jonny Gomes is too streaky to depend on. Shaw also adds that Diamondbacks first baseman Adam LaRoche has a shot at 30 home runs this season, Orioles outfielder Luke Scott should be avoided, and Pirates pitcher Zach Duke will need a trade to gain fantasy value. Ballpark Figures: Fantasy Headlines — Bloomberg Television’s Michele Steele and Bloomberg Sports Fantasy Analyst Rob Shaw are talking some baseball. Today, they discuss some of the major news items in fantasy baseball. in particular, Shaw tells us to hold on the injury-prone Jimmy Rollins of the Philadelphia Phillies. He tells us to avoid Orioles closers including the recently injured Alfredo Simon. Finally, Shaw tells us to prepare for Tigers star Miguel Cabrera to miss a few games as his wife gives birth to his child.